Objective To assess the association between risk of venous thromboembolism and use of different types of hormone replacement therapy. Design Two nested case-control studies. Setting UK general practices contributing to the QResearch or Clinical Practice Research Datalink (CPRD) databases, and linked to hospital, mortality, and social deprivation data. Participants 80 396 women aged 40-79 with a primary diagnosis of venous thromboembolism between 1998 and 2017, matched by age, general practice, and index date to 391 494 female controls. Main outcome measures Venous thromboembolism recorded on general practice, mortality, or hospital records. Odds ratios were adjusted for demographics, smoking status, alcohol consumption, comorbidities, recent medical events, and other prescribed drugs. Results Overall, 5795 (7.2%) women who had venous thromboembolism and 21 670 (5.5%) controls had been exposed to hormone replacement therapy within 90 days before the index date. Of these two groups, 4915 (85%)and 16 938 (78%) women used oral therapy, respectively, which was associated with a significantly increased risk of venous thromboembolism compared with no exposure (adjusted odds ratio 1.58, 95% confidence interval 1.52 to 1.64), for both oestrogen only preparations (1.40, 1.32 to 1.48) and combined preparations (1.73, 1.65 to 1.81). Estradiolhad a lower risk than conjugated equine oestrogen for oestrogen only preparations (0.85, 0.76 to 0.95) and combined preparations (0.83, 0.76 to 0.91). Compared with no exposure, conjugated equine oestrogen with medroxyprogesterone acetate had the highest risk (2.10, 1.92 to 2.31), and estradiol with dydrogesterone had the lowest risk (1.18, 0.98 to 1.42). Transdermal preparations were not associated with risk of venous thromboembolism, which was consistent for different regimens (overall adjusted odds ratio 0.93, 95% confidence interval 0.87 to 1.01). Conclusions In the present study, transdermal treatment was the safest type of hormone replacement therapy when risk of venous thromboembolism was assessed. Transdermal treatment appears to be underused, with the overwhelming preference still for oral preparations. Venous thromboembolism (VTE) is a rare but serious risk associated with hormone replacement therapy (HRT). HRT is used to prevent a range of symptoms experienced by many women during the menopause, such as hot flushes and night sweats. In 2015, in response to a halving of HRT use after two large studies12 had raised concerns about the safety profile of HRT (including VTE risk), the National Institute for Health and Care Excellence (NICE) published its first guideline on diagnosis and management of menopausal symptoms in the United Kingdom.3 A central theme was the need to inform women of the risks and benefits of HRT so that they can make appropriate treatment choices; but the recommendations relate to overall use of HRT, distinguishing only between oral and transdermal preparations.3 The guideline recommends further research on the risks of HRT containing different types of progestogens in combination with oestrogen. The guideline also notes that the VTE risk appears greater for oral preparations than for transdermal treatment. The guideline is likely to result in an increase in HRT use in women with menopausal symptoms, increasing the need for detailed studies of the long term risks of different HRT regimens. Oral HRT formulations can be oestrogen only (unopposed) using conjugated equine oestrogen or estradiol, or oestrogen combined with a progestogen (opposed). Progestogens in combined formulations include medroxyprogesterone acetate or newer agents such as norgestrel, dydrogesterone, or drospirenone. Previous studies assessing the VTE risk associated with different HRT treatments either have not distinguished between the types of oestrogen or progestogen, or were powered to analyse only the most common preparations.45 Findings from randomised controlled trials summarised in a Cochrane systematic review4 were based mainly on the Women’s Health Initiative trial of women in the United States, who were predominantly in relatively good health.6 The review reported that increased risk was associated with oestrogen only oral preparations, and with oral combinations of conjugated equine oestrogen and medroxyprogesterone acetate. Other preparations have become available in the past 20 years and across other countries, but observational studies on these treatments, which have been summarised in a meta-analysis, did not have consistent definitions of outcome and were not sufficiently powered to investigate individual types of HRT.5 Therefore, there is insufficient information on VTE risk associated with specific HRT formulations for clinicians and women to make informed choices about treating menopausal symptoms. Our case-control study, based on the general female population in the UK, aimed to assess the associations between VTE risk and all available types of HRT in the UK between 1998 and 2017. The study performed additional analyses of subgroups of women based on age and body mass index. Full details of the study design have been published elsewhere.7 In summary, we conducted nested case-control studies using the two UK primary care research databases QResearch and Clinical Practice Research Datalink (CPRD) and included all practices, which had contributed data for at least a year. We identified two open cohorts of women aged 40-79 years and registered with study practices between January 1998 and February 2017. We excluded women with previous records of VTE or with less than one year of medical records. For the QResearch database, we identified cases of incident VTE recorded between January 1998 and February 2017 in the general practice records, or in hospital admissions or mortality records. For the CPRD analysis, we identified cases by using only the general practice records. We used incidence density sampling for both databases to match each case to up to five controls from the same practice and by year of birth.8 The first date of diagnosis of VTE for cases became the index date for matched controls. We used HRT prescription information for the last year before the index date and included types of oestrogen and progestogen, dosage, and duration of exposure. We defined overall exposure to HRT as any exposure to oral or transdermal (patch, subcutaneous, or gel formulation) preparations containing estradiol. Oral and transdermal exposures were analysed separately. We identified a few treatments that included both tablets and patches; in such instances, the patient was considered to have been exposed to both oral and transdermal HRT. Exposure was categorised as recent (within 90 days before the index date), past (91-365 days), or no exposure. The study’s main focus was on recent exposure to HRT, because a previous study showed that past exposure is not associated with increased risk of VTE.9 All included women had records for the one year before the index date; therefore, if women had no HRT prescriptions in this period, it meant that they were not exposed in terms of this study definition. We classified exposure based on the most recent HRT prescription in the 90 days before the index date. Oral HRT included oestrogen only preparations (conjugated equine oestrogen and estradiol) and combined preparations (oestrogen with medroxyprogesterone acetate, dydrogesterone, norethisterone acetate, norgestrel/levonorgestrel, or drospirenone). Because of low numbers of participants exposed to norgestrel/levonorgestrel or to drospirenone, we analysed these preparations as one type of drug—that is, other progestogens structurally related to testosterone.10 Transdermal HRT included oestrogen only and combined estradiol and we analysed this route of administration separately. We removed participants from the analysis if they had prescriptions for two different types of oestrogen or progestogen in the last 90 days issued on the same date. A few women had switched to another HRT within the last 90 days, so we added a switch indicator to the analysis. We also analysed different regimens—cyclical or continuous—overall and separately for preparations with a sufficient number of cases (estradiol combined with norethisterone, and estradiol combined with dydrogesterone). The dose was categorised as low (≤0.625 mg for oral conjugated equine oestrogen, ≤1 mg for oral estradiol, ≤50 μg for transdermal estradiol) or high. We assessed exposure duration in the year before the index date by adding up the days of prescriptions plus any periods between prescriptions of shorter than 90 days. Duration was categorised as short term (≤84 days) or long term (>84 days). No use of HRT in the past year was the reference category for all analyses. Our analysis also included other preparations with oestrogen or progestogen that are used as topical (cream) or vaginal (pessaries) treatments. In addition, we included two other drugs that do not contain oestrogen: tibolone for menopausal symptoms and raloxifene for osteoporosis. We adjusted the analyses for confounding factors, which might have influenced whether doctors prescribed HRT or what specific HRT treatment was chosen. These factors are listed in table 1 and include lifestyle factors such as smoking status and body mass index, family history of VTE, comorbidities, and acute conditions associated with increased VTE risk.11 Comorbidities had to be recorded at any time before the index date, and included asthma, atrial fibrillation, cancer, cardiovascular disease, chronic obstructive pulmonary disease, chronic renal disease, coagulation disturbances, congestive cardiac failure, inflammatory bowel disease, rheumatoid arthritis, systemic lupus erythematosus, and varicose veins. We considered acute conditions to be confounders if they were recorded in the six months before the index date; these conditions were gall bladder surgery, hip fracture or hip replacement operation, pregnancy, respiratory infection, and urinary tract infection. The analysis also included hospital admissions between two and six months before the index date. Other drugs that could be prescribed to women using HRT were included, either as current use (within 90 days before the index date) or past use (91-365 days before the index date). These were antipsychotics, antidepressants (tricyclic, selective serotonin reuptake inhibitors, and others), aspirin, tamoxifen, oral contraceptives, and progestogen only preparations. We conducted analyses of QResearch and CPRD separately, but tried to keep the study designs as similar as possible (identical when data availability allowed). Adjusted estimates from the databases were combined by a meta-analysis technique. The findings were consistently similar between the databases; we did not expect or detect any heterogeneity. Therefore, we used a fixed effect model to combine the results of the two analyses, and we report only combined adjusted odds ratios in the text and figures. We present adjusted odds ratios for the separate QResearch and CPRD analyses in the tables and supplementary tables. We used the number needed to harm to estimate the magnitude of VTE risk in women exposed to oral HRT13; this was based on the adjusted odds ratios from the combined analysis and the VTE rate in the unexposed population. We obtained this rate using CPRD data by following the cohort until the first prescription of HRT. Because exposure to HRT is highest in women aged 55-64 and VTE risk increases with age, we calculated the overall risk and the risk by age. To account for multiple comparisons, we chose a 1% significance level. We calculated 95% confidence intervals to allow comparison with other studies. Stata version 15 was used for all analyses. We ran three sensitivity analyses to address a number of assumptions. Firstly, to assess the assumption that previous use of anticoagulants was not related to an unrecorded VTE event, we ran an analysis excluding all women with previous exposure to anticoagulants. Secondly, we conducted a sensitivity analysis because of a difference in the data sources between QResearch and CPRD. All QResearch practices are linked to hospital admissions, mortality, and Townsend deprivation data whereas only 56% of CPRD practices (61% of included patients) are linked. For the main analysis, we used data from all the CPRD practices, but for this sensitivity analysis we only included linked CPRD practices. We also excluded participants with previous VTE events on hospital records from this second sensitivity analysis. Thirdly, to assess the plausibility of the missing at random assumption, we performed an analysis on women with complete data for body mass index, smoking status, and alcohol consumption. For ease of comparisons with other studies, we conducted four additional analyses. Firstly, we ran an analysis on women with a VTE diagnosis supported by hospital admissions or mortality records, or with anticoagulant prescriptions six weeks before or after the VTE diagnosis. We used only practices with linked data for this analysis. Secondly, we ran an additional analysis on idiopathic participants who did not have any of the comorbidities or recent medical events associated with an increased risk of VTE. We also conducted two subgroup analyses using two clinically important variables to stratify risk: age (categories 40-54, 55-64, 65-79 years), and body mass index (categories: not overweight or obese, <25; overweight, 25-30; and obese, >30). These analyses investigated whether associations differed among the subgroups. This study was unfunded, so patient and public involvement initially envisaged in anticipation of funding was not possible. No patients were involved in setting the research question or the outcome measures, nor were they involved in developing plans for design or implementation of the study. No patients were asked to aid in interpreting or disseminating the results. There are no plans to disseminate the results of the research to the relevant patient community. We identified 52 137 cases from the QResearch database between 2 January 1998 and 5 February 2017 (the latest available data linkage date) using general practice, hospital admissions, or mortality records. We identified 28 259 cases from the CPRD database between 2 January 1998 and 22 February 2017 using general practice records. Of the CPRD cases, 16 638 were also linked to hospital admissions and mortality data between 2 January 1998 and 31 March 2016; these cases were used in a sensitivity analysis (fig 1). Table 1 presents the characteristics of the study participants across the databases. More than half of the women who had VTE were aged 65 or older; they were also more likely to have comorbidities than controls (overall, 56% v 36%), such as cancer (21% v 7%), cardiovascular disease (13% v 9%), or chronic renal disease (8% v 5%). Women who had VTE were more likely than controls to have recent medical events than controls (27% v 12%), such as respiratory or urinary infection (20% v 10%), hip fracture or operation (3.4% v 0.3%), or hospital admission (7% v 1%), and to use antidepressants (24% v 14%; table 1). When combining CPRD and QResearch results, we found that 5795 (7.2%) women with VTE and 21 670 (5.5%) controls were exposed to HRT in the 90 days before the index date. Figure 2 presents all available preparations and the numbers of exposed cases (for controls supplementary eFigure 1). In women exposed to HRT, 4915 (85%) cases and 16 938 (78%) controls used oral preparations, including 102 (1.8%) cases and 312 (1.4%) controls who also had transdermal preparations; 880 (14%) cases and 4731 (19%) controls used transdermal HRT only. Most of the transdermal preparations were prescribed in the form of patches (87% (n=858) in cases, 88% (n=4460) in controls), with only small proportions of women having subcutaneous and gel preparations (fig 2 and supplementary eFigure 1). Supplementary eTable 1 presents the number of study participants unexposed and exposed to oral and transdermal HRT across the confounding factors to highlight differences in prescribing. Women in the two younger age groups were more likely to have been exposed to HRT than women in the oldest group. Women exposed to HRT were less likely to be obese and have comorbidities such as cardiovascular disease, chronic renal disease, and cancer, but more likely to have used antidepressants. Women using transdermal HRT were more likely to have had oophorectomy or hysterectomy than women on oral HRT (73% (n=714) cases and 67% (n=3407) controls v 45% (n=2185) cases and 43% (n=7278) controls); these women were also slightly older and had more comorbidities (supplementary eTable 1). Table 2 shows the number of study participants exposed to all types of HRT and adjusted odds ratios by database and for the combined analysis, compared with no exposure (unadjusted odds ratios are presented in supplementary eTable 2). Table 3 presents information for direct comparisons between different types of HRT. Overall exposure to HRT in the past 90 days was associated with a 43% increased VTE risk (adjusted odds ratio 1.43, 95% confidence interval 1.38 to 1.48; table 2) compared with no HRT use in the past year. Use of oral preparations was associated with a significantly increased VTE risk (1.58, 1.52 to 1.64), whereas transdermal HRT was not associated with VTE risk (0.93, 0.87 to 1.01; table 2). Compared with transdermal HRT, oral HRT was associated with a 70% increased risk of VTE (1.70, 1.56 to 1.85; table 3). Oral oestrogen only and oral combined preparations were associated with increased VTE risk (adjusted odds ratio 1.40, 95% confidence interval 1.32 to 1.48, and 1.73, 1.65 to 1.81, respectively; table 2). Different types of oestrogen were associated with different risks. Oestrogen only preparations using conjugated equine oestrogen had higher VTE risks than preparations using estradiol (fig 3). Compared with oestrogen only conjugated equine oestrogen, use of oestrogen only estradiol was associated with a 15% reduction in VTE risk (0.85, 0.76 to 0.95; table 3). For combined oral preparations, the risks were significantly increased for conjugated equine oestrogen (1.91, 1.79 to 2.05) and estradiol preparations (1.59, 1.49 to 1.69; table 2) compared with no HRT use in the past year. Direct comparison between the types of oestrogen showed a 17% lower risk for combined estradiol than for combined conjugated equine oestrogen (0.83, 0.76 to 0.91; table 3). For oral combined HRT, conjugated equine oestrogen with medroxyprogesterone acetate was associated with the highest risk of VTE (adjusted odds ratio 2.10, 95% confidence interval 1.92 to 2.31), and estradiol with dydrogesterone with the lowest risk (1.18, 0.98 to 1.42; table 2 and fig 3). Compared with conjugated equine oestrogen with medroxyprogesterone, estradiol with dydrogesterone and estradiol with norethisterone were associated with 44% and 20% lower VTE risks, respectively (0.56, 0.45 to 0.69, P<0.001, and 0.80, 0.71 to 0.89, P<0.001, respectively; table 3). Overall, continuous and cyclical regimens for combined oral preparations were associated with an increased risk of VTE compared with no HRT use (adjusted odds ratio 1.55, 95% confidence interval 1.44 to 1.66, and 1.88, 1.77 to 1.99, respectively; table 2). However, not all combinations and age groups were equally covered. Younger women were more likely to be prescribed cyclical preparations and older women continuous preparations (supplementary eTable 3). Not all combined preparations were prescribed for cyclical and continuous regimens; conjugated equine oestrogen with medroxyprogesterone acetate was available mostly as a continuous regimen, whereas conjugated equine oestrogen with norgestrel was generally cyclical (fig 2 and supplementary eFigure 1). Only two preparations, estradiol with dydrogesterone and estradiol with norethisterone, had sufficient observations to assess the effect of the regimen. Neither cyclical nor continuous estradiol with dydrogesterone were associated with a statistically significantly increased VTE risk (1.21, 0.95 to 1.53, and 1.13, 0.84 to 1.53, respectively; table 2). Cyclical and continuous use of estradiol with norethisterone were associated with increased VTE risk compared with no HRT use (1.44, 1.28 to 1.63, and 1.80, 1.66 to 1.95, respectively; table 2). 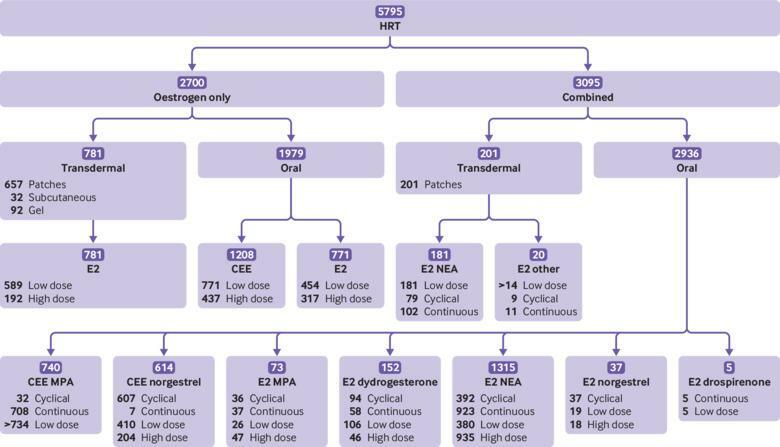 A large proportion of women using transdermal HRT had oestrogen only preparations (80% (n=781) in cases and 76% (n=3850) in controls (table 2). For combined preparations, norethisterone was the most common progestogen, with very low numbers for levonorgestrel and dydrogesterone, and most of the transdermal preparations had a lower dose of estradiol (fig 2). None of the transdermal preparations (oestrogen only or combined, low dose or high dose, combined cyclical or continuous) was associated with an increased VTE risk (table 2). Only a small proportion of women (about 10%) had a short exposure of fewer than 84 days, and we did not detect any differences in risk compared with longer exposure (supplementary eTable 4). Tibolone was used by 368 women with VTE and 1859 controls, and its use was not associated with VTE risk (adjusted odds ratio 1.02, 95% confidence interval 0.90 to 1.15; table 2). A small number of women (180 cases and 631 controls) used raloxifene, which was associated with a significantly increased VTE risk (1.49, 1.24 to 1.79; table 2). Use of conjugated equine oestrogen cream or estradiol vaginal preparations was not associated with VTE risk (table 2). Past exposures to HRT in the 91-365 days before the index date were not significantly associated with increased VTE risk (supplementary eTable 5). The rate of VTE for the unexposed population based on the CPRD cohort was 16.0 per 10 000 women years. The rate differed among age groups: 9.0 per 10 000 women years for age 40-54, 22.2 for age 55-64, and 35.1 for age 65-79. 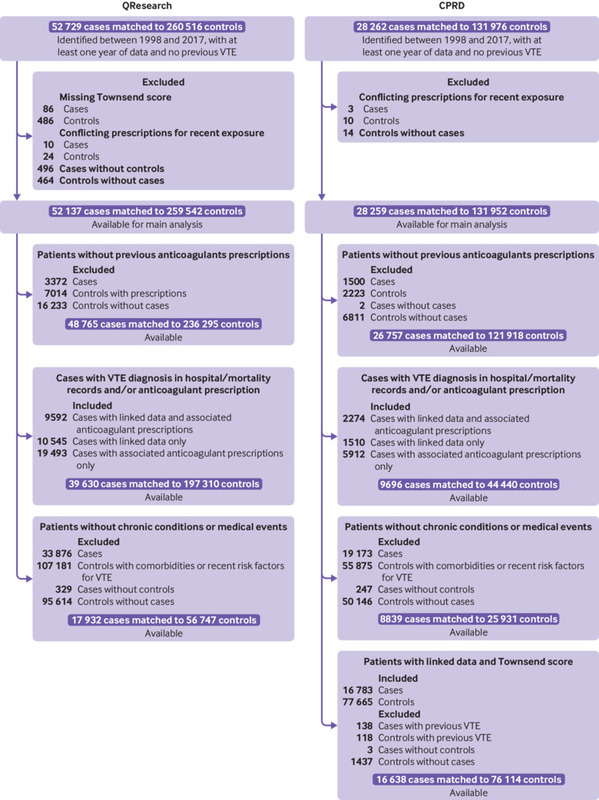 Additional VTE cases were expected because of the increased VTE risk for users of most oral preparations (table 4). For overall oral HRT use across all age groups, the number needed to harm was 1076 (95% confidence interval 974 to 1196) and the number of extra VTE cases was nine per 10 000 women years (95% confidence interval 8 to 10; table 4). The highest number of extra cases was for conjugated equine oestrogen with medroxyprogesterone acetate (18 per 10 000 women years, 15 to 21), but this also increased with age (8 per 10 000, 5 to 13, for age 40-54; 37 per 10 000, 26 to 50, for age 64-79; table 4). The first sensitivity analysis run on cases and controls without previous anticoagulant prescriptions produced similar results to the main analysis, with a consistent difference among odds ratios of up to 0.02. In this analysis, estradiol with medroxyprogesterone acetate was associated with a statistically significantly increased VTE risk (fig 4 and supplementary eTable 6). The second sensitivity analysis used only hospital and mortality linked data for CPRD and produced similar results (supplementary eTable 7). The third sensitivity analysis run on cases and controls with complete data also gave similar findings (supplementary eTable 8). The results from the analysis of cases with associated anticoagulant prescriptions or a VTE diagnosis from hospital or mortality records were similar; however, the reduced risks observed for women using transdermal therapy were statistically significant in the QResearch analysis, and consequently, in the combined analysis (fig 4 and supplementary eTable 9). The subgroups for all these sensitivity analyses had similar HRT exposures to the main groups of cases and controls. Selected women in the subgroups of idiopathic cases and matched controls had to be free of comorbidities; therefore, these subgroups were younger than the main sample. Women in the subgroups had higher exposure to HRT (9.0% v 7.2% for cases and 6.6% v 5.5% for controls; table 2 and supplementary eTable 10). The average number of matched controls per case was lower than in the main analysis (mean 3.09 compared with 4.87). Findings were generally similar to the main analysis but with slightly wider confidence intervals. However, preparations with estradiol and medroxyprogesterone acetate were also associated with a statistically significant increased risk in VTE (fig 4 and supplementary eTable 10). Women in the age group 55-64 had the most HRT exposure (13.3% cases and 10.3% controls; supplementary eTable 12) compared with age groups 40-54 (10.8% cases and 7.8% controls; supplementary eTable 11) and 65-79 (3.1% cases and 2.6% controls; supplementary eTable 13). The results were consistent across age subgroups and with the main analysis, but the odds ratios were slightly higher for the age group 55-64. Overall exposure for oral HRT was associated with a significantly increased VTE risk in all age groups (adjusted odds ratio 1.52, 95% confidence interval 1.42 to 1.63, for age 40-54; 1.69, 1.59 to 1.80, for age 55-64; and 1.53, 1.42 to 1.65, for age 65-79; fig 5 and supplementary eTables 11-13). Selecting women with VTE in a specific body mass index category and restricting matched controls to women in the same body mass index category resulted in a reduced number of controls per case (not overweight or obese, mean 2.01; overweight, 1.81; obese, 1.64). Women who were not overweight or obese had the highest exposure to HRT (8.8% cases and 7.0% controls; supplementary eTable 14) compared with those who were overweight (7.8% cases and 5.3% controls; supplementary eTable 15) and obese (5.4% cases and 3.8% controls; supplementary eTable 16). The overall risk for oral HRT was the highest in the overweight subgroup (adjusted odds ratio 1.50, 95% confidence interval 1.37 to 1.64, for women who were not overweight or obese; 1.79, 1.63 to 1.97, for women who were overweight; and 1.65, 1.48 to 1.84, for women who were obese; supplementary eTables 14-16). For the different types of HRT, the confidence intervals were wider but the results were consistent among all body mass index subgroups and with the main analysis (fig 6 and supplementary eTables 14-16). This study showed increased VTE risks for all oral HRT formulations, including combined and oestrogen only preparations. Overall, preparations with conjugated equine oestrogen were associated with higher risks than preparations using estradiol. Conjugated equine oestrogen with medroxyprogesterone acetate had the highest risk and estradiol with dydrogesterone had the lowest risk. Higher doses of oestrogen were associated with higher VTE risks. Transdermal HRT was not associated with any increased VTE risk and this finding was consistent for different regimens. This observational study of the UK general female population aged 40-79 used data from the two largest UK primary care databases, and routinely collected primary care data linked to secondary care data, and mortality records. The study matched cases and controls by age and general practice to account for differences in recording and prescribing across practices. Analyses adjusted for many confounding factors such as chronic and acute conditions, lifestyle factors, and social deprivation. The study included all eligible cases, and additional analyses addressed assumptions. One sensitivity analysis in a subgroup of women with no previous use of anticoagulants reported similar results to the main analysis. This sensitivity analysis indicates that most of the excluded women had probably used anticoagulants because of atrial fibrillation or hip replacement operations rather than an earlier unrecorded VTE. Records of test results confirming VTE diagnoses were not available to researchers. However, the sensitivity analysis, restricted to cases with subsequent prescriptions for anticoagulants or a VTE diagnosis from hospital or mortality records, supported the findings of the main analysis. In both the main analysis and the additional analysis, use of transdermal treatment was associated with a slight absolute reduction in VTE risk. There is no biological explanation for this protective effect; therefore, this small decrease might reflect some residual confounding or possible indication bias. The finding was not statistically significant in the main analysis, but we reported a slightly greater, statistically significant decrease in the sensitivity analysis for the QResearch data. This is likely a spurious finding, possibly related to selection bias. The study did not provide information about risks in patients with various conditions, but did separate VTE risks associated with HRT from those associated with chronic and acute conditions by running an additional analysis on patients without these conditions. The results proved similar and suggest a probable independent effect of HRT on VTE risk. Additional analyses based on age and body mass index provided extra information, but the results remained consistent across the categories and with the main results. Although the analysis included all HRT preparations available in the UK, some preparations were not sufficiently prescribed to be assessed individually, such as estradiol with drospirenone, or estradiol with norgestrel or levonorgestrel. Frequently prescribed preparations, however, did have enough observations to study dosage effects. We were unable to assess differences in risks for women who had recently started or restarted HRT because the majority of women had been using HRT for more than 84 days. The study also could not address several uncertainties. Exposure information was based on HRT prescriptions and not actual use. However, it is unlikely that cases and controls differed systematically in their adherence to HRT. Although we used all available information on confounding factors, data on important factors such as precise indications for HRT, age at menopause, and education level were not available. For a small but non-negligible proportion of women, data on smoking status, alcohol consumption, and body mass index were missing and had to be multiply imputed for the analysis. All of these limitations could have resulted in some residual confounding bias. Several randomised controlled trials have assessed the safety of HRT, but most have not been sufficiently powered to assess VTE outcomes. Seventy per cent of data used in two recent meta-analyses414 were derived from two arms of one large trial on healthy American women (Women’s Health Initiative).6 The trial also concentrated on conjugated equine oestrogen based preparations most commonly used in the US. The Cochrane meta-analysis4 included VTE risks for up to two years of exposure to oestrogen only conjugated equine oestrogen (risk ratio 2.22, 95% confidence interval 1.12 to 4.39) and conjugated equine oestrogen with medroxyprogesterone acetate (2.98, 1.88 to 4.71); the findings were slightly higher than those in our study. 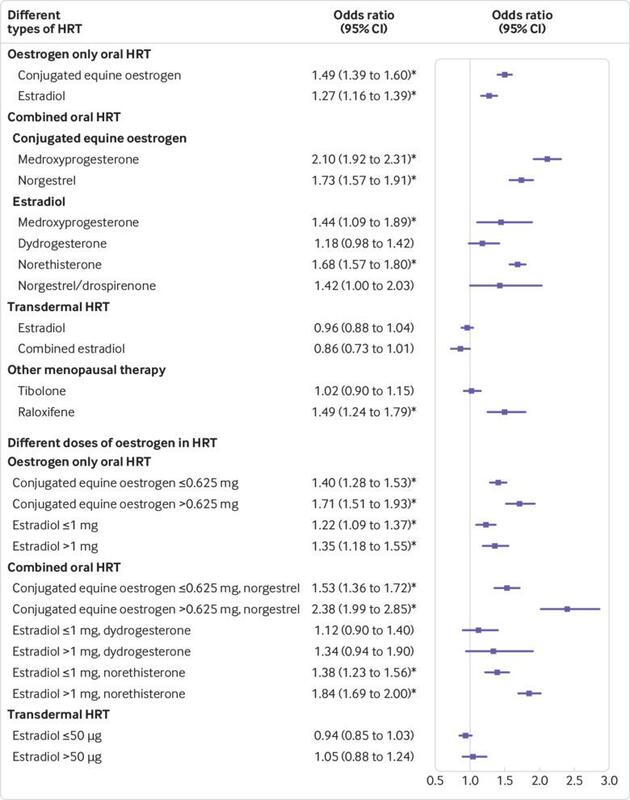 The other meta-analysis14 pooled oestrogen only preparations and combined oestrogen with progestogen preparations and reported increased VTE risks for both types of HRT (relative risk 1.43, 95% confidence interval 1.11 to 1.85; and 1.95, 1.54 to 2.47). These results are similar to our findings for oral preparations. Most of the observational studies did not distinguish between different types of HRT and assessed the overall risks associated with all formulations. Several studies had separated oral and transdermal use and reported higher risks for oral HRT.1516171819 One meta-analysis reported the combined findings of oral versus transdermal HRT (relative risk 1.63, 95% confidence interval 1.40 to 1.90).5 These results are in line with our findings (odds ratio for oral HRT v transdermal HRT 1.70, 95% confidence interval 1.56 to 1.85). Some studies have assessed the risks associated with different oestrogen doses and reported higher risks with higher doses.181920 One study compared cyclical use with continuous use and found higher risks associated with continuous use.19 Some studies based on the US population included the most frequently prescribed HRT, conjugated equine oestrogen with medroxyprogesterone, simply extrapolating the results to all synthetic progesterones.2122 A US study extended the exposure to estradiol with medroxyprogesterone, but the study was not sufficiently powered to show increased VTE risk.20 Two French studies investigated VTE risks associated with different pharmacological classes of progestogens and found that pregnane progesterones including dydrogesterone and medroxyprogesterone acetate were not associated with increased VTE risk.1617 However, these two studies were insufficiently powered and produced findings with wide confidence intervals. The HRT research recommendations from NICE raise concerns about VTE risk and about some cancers—in particular breast cancer—so a complementary detailed study of cancer risks is needed for a more complete picture. We are preparing such a study, based on the same data sources. This large observational study, based on the UK general female population aged 40-79, provides information on VTE risk in women taking different types of HRT. The study shows that conjugated equine oestrogen based oral preparations, combined or oestrogen only, are associated with higher VTE risk than estradiol based preparations. Higher oestrogen dose is also associated with higher VTE risk. However, transdermal HRT or tibolone, used much less frequently, are not associated with any increased VTE risk. Therefore, the study provides more information for clinicians and women about relative VTE risks and highlights that oral HRT is still the preferred choice over other forms of treatment with no associated VTE risks. We acknowledge the contribution of EMIS (Egton Medical Information Systems) practices who contribute to the QResearch database and EMIS, and the University of Nottingham for expertise in establishing, developing, and supporting the QResearch database. The hospital episode statistics data used in this analysis are re-used by permission from NHS Digital who retain the copyright. We thank the Office of National Statistics (ONS) for providing the mortality data. ONS and NHS Digital bear no responsibility for the analysis or interpretation of the data. QResearch acknowledges funding from the NIHR funded Nottingham Biomedical Research Centre. Mohammed Mustafa (Division of Population Medicine, School of Medicine, Cardiff University) contributed advice, in particular on the pharmacology of treatments and decisions made in the prescribing process, at an early stage of the study and we are grateful for his input. Contributors: YV contributed to the study protocol, reviewed the literature, designed the study, organised the extraction of CPRD data, did the analysis on both datasets, and wrote the draft of the manuscript. JHC initiated the study, undertook the original literature review, drafted the study protocol, organised the extraction of the QResearch data, advised on clinical aspects of the study and interpretation of the results and drafting of the paper. CC contributed to the development of the idea and the study design and advised on the analysis and interpretation of the results. JHC and CC critically reviewed the paper. YV is the guarantor of the study. All authors have approved the submitted version. The corresponding author attests that all listed authors meet authorship criteria and that no others meeting the criteria have been omitted. Funding: There was no external funding for this study. Competing interests: All authors have completed the ICMJE uniform disclosure form at www.icmje.org/coi_disclosure.pdf and declare: no support from any organisation for the submitted work; JHC is professor of clinical epidemiology at the University of Nottingham and unpaid director of QResearch, a not-for-profit organisation which is a joint partnership between the University of Nottingham and EMIS (commercial IT supplier for 60% of general practices in the UK); JHC is also a paid director of ClinRisk, which produces open and closed source software to ensure the reliable and updatable implementation of clinical risk algorithms (including QRISK2) within clinical computer systems to help improve patient care; no other relationships or activities that could appear to have influenced the submitted work. Ethical approval: The protocol for QResearch has been published in ePrints and was reviewed in accordance with the requirements for the East Midlands Derby research ethic committee (ref 03/4/021). The protocol for CPRD has been approved by the Independent Scientific Advisory Committee for MHRA Database Research (N 16_275R). Data sharing: To guarantee the confidentiality of personal and health information only the authors have had access to the data during the study in accordance with the relevant licence agreements. Access to the QResearch data is according to the information on the QResearch website (www.qresearch.org). CPRD linked data were provided under a licence that does not permit sharing. The lead author affirms that the manuscript is an honest, accurate, and transparent account of the study being reported; that no important aspects of the study have been omitted and that any discrepancies from the study as planned have been explained.
. Menopause: diagnosis and management. NICE guideline NG23 2015. https://www.nice.org.uk/guidance/ng23. Vinogradova Y, Coupland C, Mustafa M, et al. Protocol to assess risk of venous thromboembolism associated with use of hormone replacement therapy in real world settings: two nested case-control studies in primary care. 2018. http://eprints.nottingham.ac.uk/id/eprint/51356.
. Multiple imputation of missing values. Stata J2004;4:227-41.